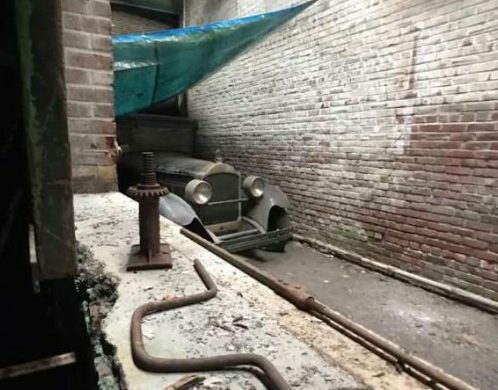 1927 Packard Found in Abandoned Factory! A former metal working shop and textile production warehouse in Philadelphia held a little-known secret for over forty-five years. 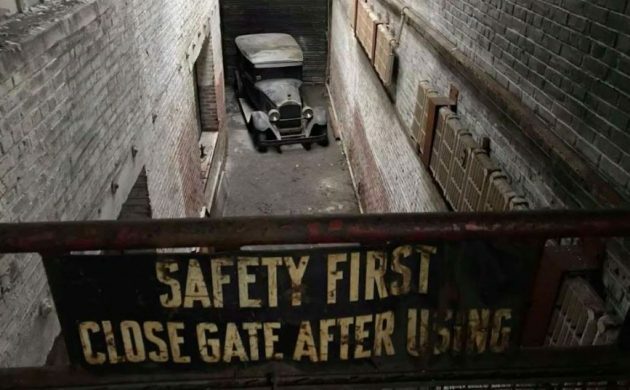 Housed within its brick walls and dusty floors was a 1927 Packard sedan. 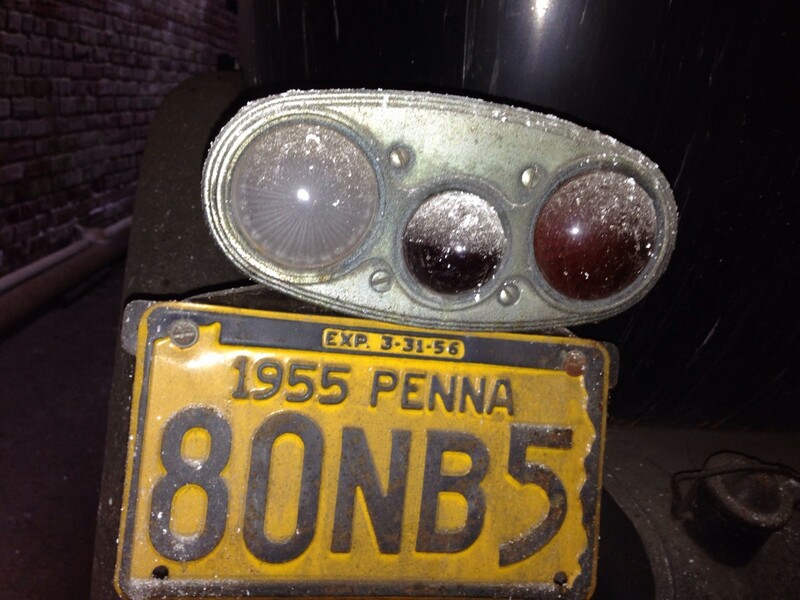 Purchased by the factory owner in the 1940s, the car served as a daily driver until it was parked in the mid-’50s. But how did it end up in the factory? Read more below to find out. You can also read more about this amazing find here on msn.com and here on PhillyVoice.com. Thanks to Alexander M. for the tip on this cool find. Here was the Packards resting spot. It looks like someone either strung a tarp over the top or covered it with a tarp at some point. To continue the story: The Packard was used by the factory owner as a daily driver for about a decade. Some mechanical issues sidelined the car in the 1950s and it was parked in a garage. 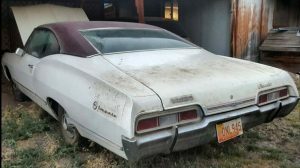 At some point, “…a change in circumstances forced the Packard out its conventional storage, and the owner opted to tuck it inside the factory for safe keeping.” The car sat in the factory from 1974 until January of this year. The car was recently pulled from the factory by the former owner’s son. The car appears to be a Packard Six sedan, with a low reading of only around 10,000 miles on the odometer. The son says the car is back in safe garage storage and their plan is to restore it to “factory fresh” condition. Good luck to them. It sounds like they saved a gem. And time keeps slipping away…. Best wishes to the family on this! I hope that it’s a labor of love instead of a profit motive. It would depend on how far out on the Main Line the owner lived, how many days into the office or a Rittenhouse Square denizen just requiring squiring around town. F. Scott Fitzgerald: The rich are different from you and me, Hemingway’s response: Yes they’ve got more more money. 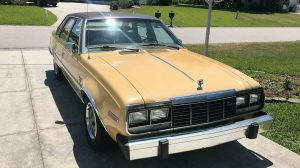 A Six probably wouldn’t justify a full restoration, money wise, but wow, it’s a handsome machine, and looks pretty solid too! 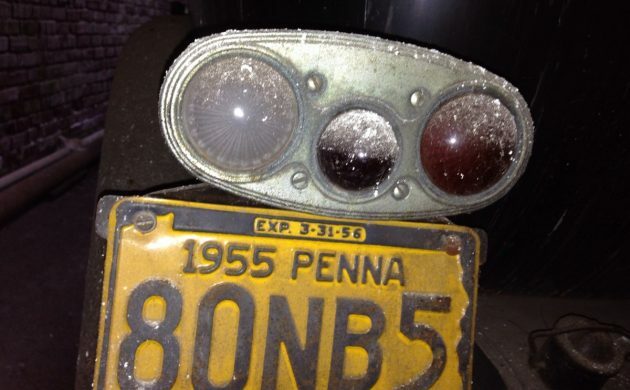 I read the story on the car and it says that it had an inspection sticker from 1955 and the plates were registered until 1956. 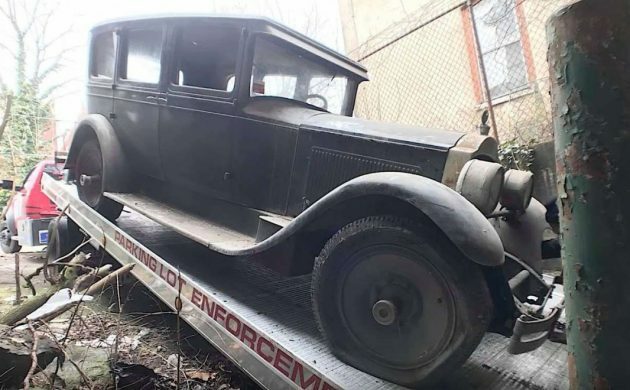 A well protected time capsule for sure and hopefully it’ll stay in the family for future generations to cherish and enjoy. .
Hello Everyone, there is a little bit of info and some footage of the car on you tube. Check it out https://www.youtube.com/watch?v=g0mJ9N8tYdI Cheers. Billy. P.S. Also this footage. https://www.youtube.com/watch?v=VwcBtqHDTB8 Cheers. Not really abandoned…..the family knew it was there and came back for it before the building is turned into condos the family has commissioned. Cool it survived. This is a misleading find. Interesting, stillrunners. Where are the condos going up? Fishtown seems to be the new hot area to change from abandoned factories to gentrification, what else might be up there hiding away? Go to “Iron Trap Garage” on YouTube for a great story on this car. I liked that video, and it passed my requirements that it wasn’t much more than 20 minutes long. My attention span doesn’t allow me to watch YouTube stuff much longer than 20 minutes. I’ll be interested in seeing the end results. I love, love, love a late 1920s-early 30s Packard with factory discs wheels instead of wires. I’ve built a handful of models in 1/32 scale with them. Very distinguished, grand even, for a Packard 6. One thing I’m always curious about on these old ones of any brand. Whether it shows 10k or 20k or 30k miles on the odometer many people think it must have a hundred thousand plus miles on the car. I know for a fact we have considerably better roads and highways these days. Home and job are often a distance apart so it’s really easy to rack up miles. 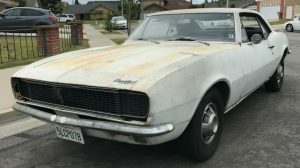 I cannot answer this so I’d like to ask the people more familiar with cars of this general vintage – were any of these old cars known to make it to 100k miles without a complete overhaul of the engine and or drive train in general? Good question David, I wonder what the average mileage of any car back in the 20’s and 30’s was, what would be classed as ‘average’ as well as ‘high mileage’ back in those days ? Is there anyone old enough to give an accurate answer to this on the Barn Finds site? Anyone care to ask their Dad or Grandfather? I reckon it would be interesting to know, especially if someone is going out hunting for an old car. Good point David and you’re absolutely right about the quality of roads in the 20’s versus the 50’s, 60’s, 70’s, etc. there was a very low percentage of paved roads when this car was new and even if they had been capable of higher speeds, the condition of the roads themselves would have prevented the cars from going very fast. The suspension systems took a real beating in most cases. As for the engines, the only real way to verify the mileage is a tear down and cylinder wear check. Most required a minimum of a valve job before 50K and when you factor in the poor quality non detergent oils available during the era, the lack of oil filters, softer castings, etc. I would say that most of them are very low mileage vehicles due to reliability issues brought on by the hard times they endured…simply put, they were victims of the environment that they were operated in. The ones that lasted are the ones that broke down after a few years, got shoved in a barn pending funding to repair them, and then ended up forgotten for whatever reason. Tony and Gary, thank you for your input. I had wondered about those factors. I recall my dad telling me when he was alive that in the 50s and early 60s that the engines were typically pretty worn out by the 100k mark even with routine maintenance. An older friend that is still working part-time in his own little shop said that the difference in metallurgy played a big part in that. I guess that once the nickel content was upped that engines could have a longer lifespan before a rebuild was needed. He couldn’t tell me anything firsthand about the older ones though because he’s only 70 and never did much of any work on the old stuff for decades. In a car with white-metal bearings, you’d be very lucky to get 50,000 out of the engine. And oils, as has been said, and no filters. Even by the 60s, engines weren’t expected to run six figures. 100,000 on a 1920s engine? Noooo….. I discovered this car 5 years ago when they were selling the contents of the building, at that time they didn’t want to sell the car. I’d just do a mechanical restoration and preserve the history of the car. That was a very interesting building, no sale on the car or anything else I asked about. Rick did pick up some old machinery. I wanted that packard and a neon clock, no sale on the clock either. My father, in the 50s, bought a new car every two years. He never wanted a car to hit 30K miles because the resale value dropped drastically at 30K. And no engine in the 40s or 50s made it to 100K without a rebuild. I have a ’46 Hudson I bought with 78K miles on the odo. I remember talking to a friend and commenting that it was a low mileage car. 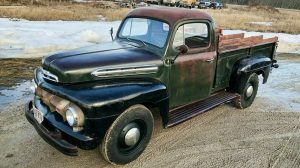 My friend’s retort was: “for a ’46, that’s a high mileage car”. Those old cars, like the Hudson, were built to last forever, and most were in the scrapyard before 10 years. Now, they are made of plastic and last forever, most going to the scrapyard never having an engine rebuild. As recent as 2007, as I was about to trade for a new pocket rocket, the salesman said since I was reading close to 75k miles on my trade in, not to run up the miles above that since my GTI wouldn’t be prepped until the end of the week. Literally a dealbreaker for him to flip the car on his lot — it would have to go wholesale if more than 75k. When I was growing up, my father would be surprised if any car we were looking at could still drive after it had rolled over. And bias ply tires would be recapped at something like 15000 miles. I know guys now with modern tires on their vintage cars that don’t even carry a spare as they haven’t had a blowout in years. I worked at Frye’s Sylvan Gulf, Englewood Cliffs, N.J. back in the 1960’s. The building is still there, 1 bay shop and all. I remember people claiming they had 60,000 miles on their car and never had the heads off yet. This was normal. Drum brakes lasted 10-15,000 miles. When disc brakes came out in the end of the 60’s the pads lasted 6,000-10,000 miles. By then I was working at Siegfried Motors, VW-Porsche. Oil changes were at 1,500 miles. A full service was done every 6,000 miles. This included valve adjustment, compression check, new points, rotor, condenser, plugs. My first ex-wife had a 1962 red VW bug. It had less than 60,000 miles and needed an engine. I rebuilt it and when it hit 100,000 miles it was a big deal and of course it was almost due for another engine overhaul. Number 3 cylinder was always gone, overheated. It was under the oil cooler and ran hot. 5.60-15 bias ply tires lasted 15-20,000 miles. No big deal since the king and link pins, brakes and clutch replacement were due by then too. I was a “B” line mechanic. The guy I worked with and I could do a clutch in 20 minutes flat. VW had a special lift that fit the car just right. We would push the car in, raise it 2 feet. My partner would get the top, undo the accelerator cable, some tin and the upper engine bolts. I would get the two lower engine bolts and the heater cables, clutch cable and the heater hoses. VW had a special floor jack that fit the engine. One of us would go to parts and get a new gland nut, clutch disk and pressure plate. VW had a special flywheel holding tool so the one of us on the creeper would get the 36 mm socket and breaker bar, take off the gland nut and flywheel. Install a new rear main seal and the flywheel, tighten the gland nut with a 2 foot cheater pipe. The new clutch parts just about fell onto the engine, I still have my former input shaft-now clutch alignment tool, then the engine would be jacked up just to the right point, slide in place, all the lower cables and stuff would get put back. The upper guy would put the engine electrical stuff and accelerator cable back on, tighten the upper engine to trans nuts, the bottom ones got tightened up and watch out! This VW was about to come down onto the ground and the engine was started and the car back out of the work bay- all in about 20 minutes. I could overhaul 3 carburetors per hour, buy myself. They paid 1 hour labor each so I was making 3 times the flat rate hour. A VW with over a 100,000 miles on it? VW’s were well built but they never got that many miles without some regular repair work. The speed limit on the NJ Turnpike was 60 mph. State speed limit was 50 mph. People drove 10,000 miles per year in those days. I remember when I 80 was being built. The 1950 and 60’s cars were not built for long distances of the interstate system. Just think of tube type bias ply tires at 90 mph hour after hour. It just did not happen until automotive technology caught up. People complain about the “new” cars are just not what the old ones were. Good thing too. Those older cars were beautiful and had a lot of class. They just were not built to last as long as today’s cars. Today you don’t even change spark plugs for 100,000 miles. Oil changes are 10,000 mile range. Today’s cars just don’t have the class of the 1920-40’s cars. That is something you just cannot add to a modern car.